Surface lakes are causing Antarctic ice shelves to ‘bend’ and buckle under the massive weight of meltwater, warns new research. Meltwater lakes can contain water weighing 50,000 to two million tons each, and that pushes downward on the ice, creating an indent. If the lake drains, this indent pops back up. If the resultant stress is large enough, the ice surrounding the lake basin weakens, and may start to break, the researchers predict. A team of British and American researchers, led by Cambridge University scientists, has measured how much the McMurdo ice shelf in Antarctica flexes in response to the filling and draining of meltwater lakes on its surface. Flexing had been simulated before by computer models, but the new study is the first time the phenomenon has been measured in the field. The findings, published in the journal Nature Communications, show a link between surface melting and the weakening of Antarctic ice shelves. They also support the idea that recent ice shelf break-up around the Antarctic Peninsula may have been triggered, at least in part, by large amounts of surface meltwater produced in response to atmospheric warming. 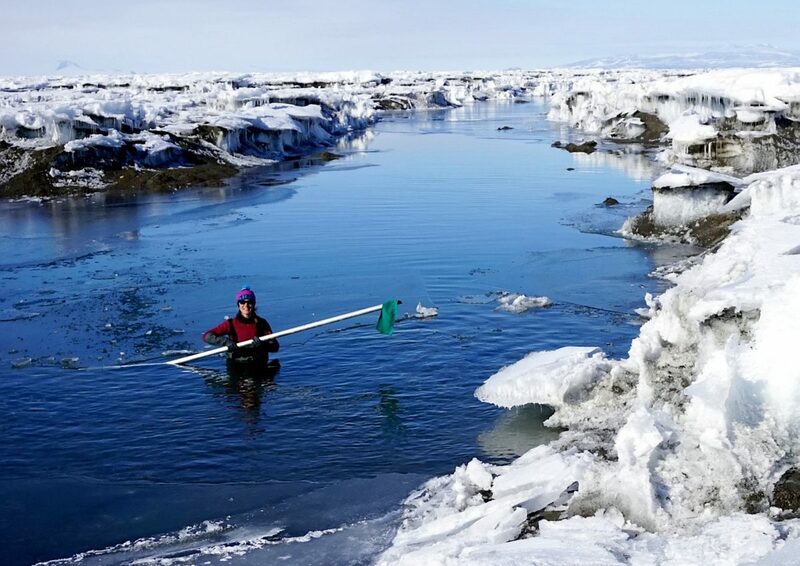 As the climate continues to warm, researchers warned more and more ice shelves may become susceptible to flex, fracture and break-up over the coming century. Most of the continent is covered by the Antarctic Ice Sheet, which is up to four kilometres (2.5 miles) thick and contains enough ice to raise global sea levels by about 58 metres (190 feet). Over most of the continent and for most of the year, air temperatures are well below zero and the ice surface remains frozen. But around 75 per cent of the ice sheet is fringed by floating ice shelves, which are up to a kilometre (3,280 ft) thick, mostly below sea level, but with several metres of their total height protruding above the water. In the summer months, when air temperatures rise above freezing, the surfaces of the ice shelves are susceptible to melting. Study co-author Dr Ian Willis, of Cambridge’s Scott Polar Research Institute (SPRI), said: “Surface water on ice shelves has been known about for a long time. “Over 100 years ago, members of both Shackleton’s Nimrod team and the Northern Party team of Scott’s British Antarctic Expedition mapped and recorded water on the Nansen Ice Shelf, around 300 kilometres from where we did our study on the McMurdo Ice Shelf. He said what is not fully known is the extent to which surface water might destabilise an ice shelf, especially in warmer summers when more meltwater is produced. If the slope of the ice shelf is sufficiently steep, Dr Willis says the water may flow off the ice shelf to the ocean in large surface rivers, mitigating against any potential instability. The danger comes if water pools up in surface depressions on the ice shelf to form large lakes. The extra weight of the water will push down on the floating ice, causing it to sink a bit further into the sea. Around the edge of the lake, the ice will flex upwards to compensate. 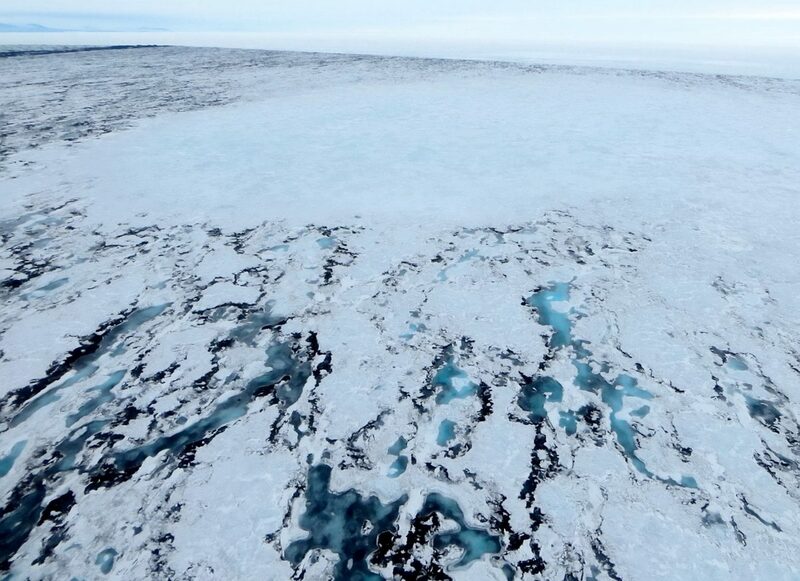 Study lead author Dr Alison Banwell, also of SPRI, said: “If the lake then drains, the ice shelf will now flex back, rising up where the lake used to be, sinking down around the edge. Dr Banwell said: “We had been able to model the rapid disintegration of that ice shelf via our meltwater loading-induced fracture mechanism. “However, the problem was that no one had actually measured ice shelf flex and fracture in the field, and so we were unable to fully constrain the parameters in our model. 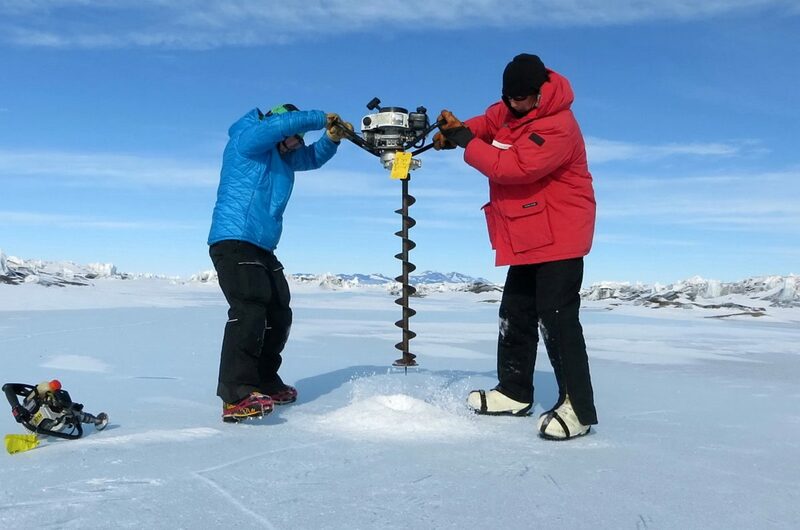 Using helicopters, snow machines and their own two feet, the researchers set up a series of pressure sensors to monitor the rise and fall of water levels in depressions which filled to become lakes. They also used GPS receivers to measure small vertical movements of the ice shelf. Co-author Professor Doug MacAyeal, of the University of Chicago, said: “It was a lot of work to obtain the data, but they reveal a fascinating story. “Most of the GPS signal is due to the ocean tides, which move the floating ice shelf up and down by several metres twice a day. “But when we removed this tidal signal we found some GPS receivers moved down, then up by around one metre over a few weeks whereas others, just a few hundred metres away, hardly moved at all. “The ones that moved down then up the most were situated where lakes were filling and draining, and there was relatively little movement away from the lakes. 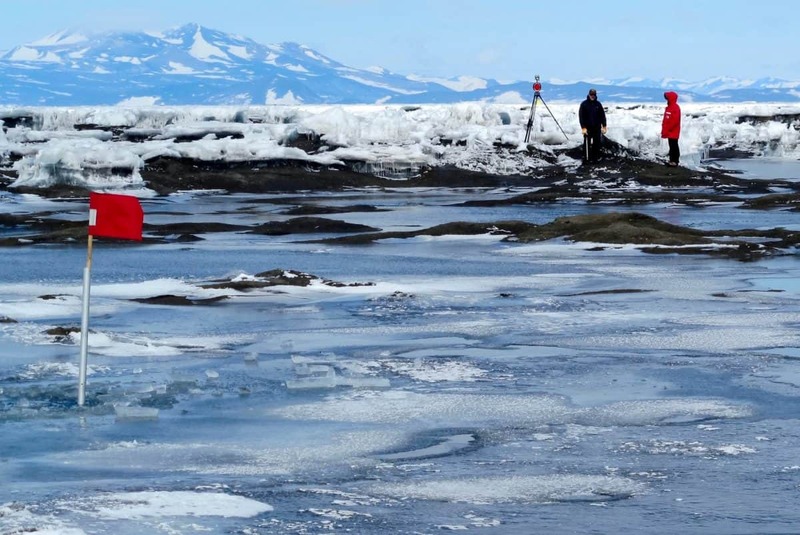 Dr Banwell added: “These observations are important because they help us better understand the triggers of ice shelf break-up, which leads to sea level rise.